old STEAM LOCOMOTIVES in South Africa: De Aar, part 4, Excelsior Park: Railway Recreation Club, preserved Cab of Class 25NC No 3434 "CORRY"
De Aar, part 4, Excelsior Park: Railway Recreation Club, preserved Cab of Class 25NC No 3434 "CORRY"
One of De Aar's pleasant surprises, is that one may take a good look at the preserved cab of SAR Class 25NC engine No 3434 at the local Railway Recreation Club at Excelsior Park in town. This name is displayed at the top left of the previous picture. However, 3434 at no stage carried the name "EMELY", as the name "CORRY" for 3434 has been recorded by several photographers. And, besides, Pierre de Wet provided more information about the origin of the "CORRY" name - see Pierre's comment further down. A closer look - click on the picture to enlarge. Look at all the glorious brass and copper work. The mechanical stoker is in the foreground. A left view - note the SAR "green" arm rest. NOTE: A similar display of a Class 25NC engine cab, for sister engine No 3444, may be seen in the Transport Museum at the Kimberley station. Also at the Kimberley station, another sister engine, 25NC No 3411, is plinthed on the platform as part of the Transport Museum display. 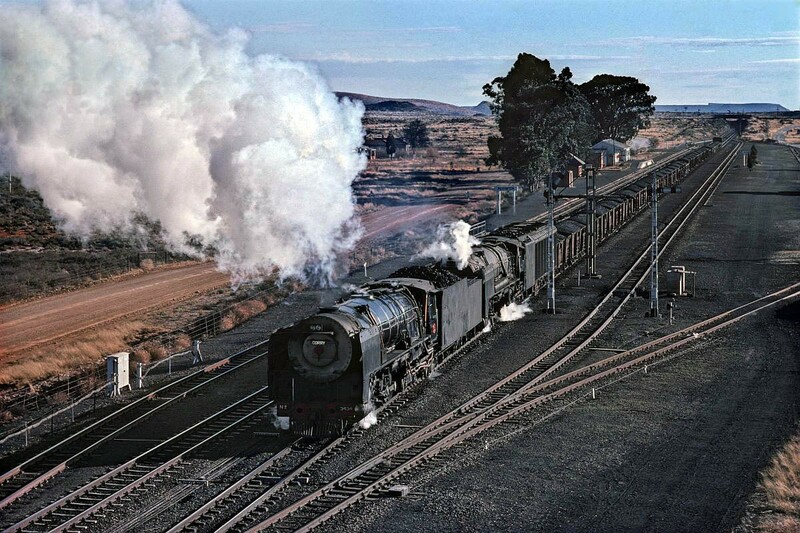 I have come across this blog entry mentioning the cabin for 3434 in De Aar's railway club. Seems they have a name plate in the vicinity with the name "Emely" on it - that could not have been the name of #3434, because coincidentally #3434 carried the name of my wife, namely CORRY. I happen to have the "CORRY" name plate here at home, together with one of the cabin number plates. Both number plates were on sale at the old Railway Museum, and I bought one for the princely sum of R300. I had to think twice before buying at that price! This was way back in about 1990. How did #3434 get my wife's name? My good friend Les Pivnic phoned me one day - probably in the early 70's, and asked whether I would like to see Corry's name on one of locomotive foreman Alec Watson's loco's stationed at De Aar? My reply was obvious. 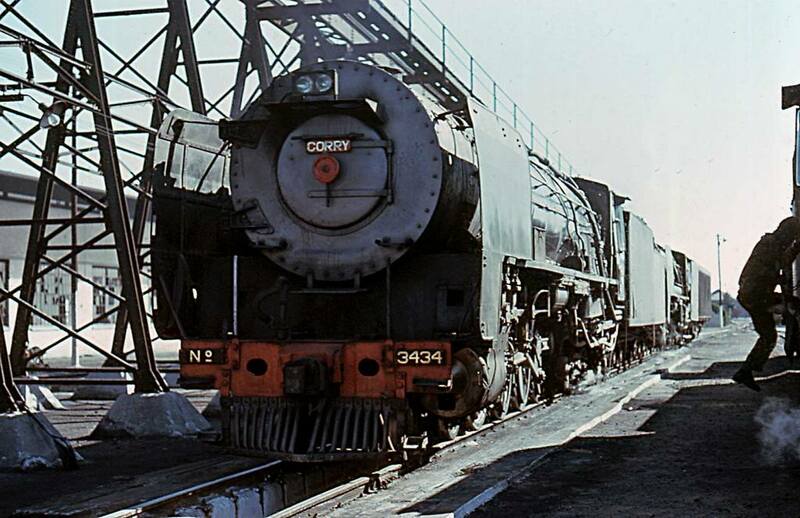 "CORRY" #3434 on the move with a load of coal at Potfontein - photo with kind permission of CP Lewis. Attached a picture by Charlie Lewis, showing "CORRY" #3434 on the move with a load of coal at Potfontein somewhere between De Aar and Kimberley. Also on page 25 of THE GREAT STEAM TREK Charlie Lewis shows another view of "CORRY", double-heading a goods train together with a condensing 25 in August 1977. For me this is a wonderful scene catching the essence of the typical Karoo. In STEEL KYALAMI Volume 1, which can be previewed on the web, amongst the last pages in the book, Dennis Moore also shows a lovely action picture of "CORRY" #3434 on 29 June 1988 in action. 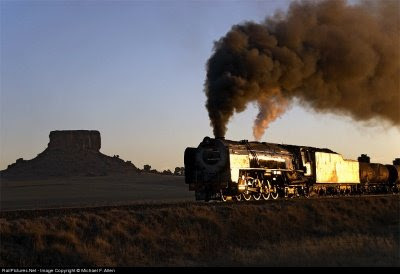 No doubt Pierre and Corry enjoy the thought that "CORRY"'s engine #3434 was not totally scrapped, but that the cabin still exists in all it's glory in a safe place in DE AAR. 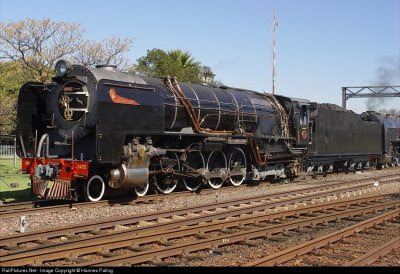 N0 3472 is kept steaming by Reefsteamers in Germiston. Reefsteamers say: "Our Class 25NC 'Elize' was restored and put back into operation in 2006 after a long standing problem with the safety valve saddle plate was overcome. She has become our 'flagship' (or should that be, 'Flag Loco') and is a reliable, easy riding locomotive with fine performance. This large, modern locomotive is a bit too heavy on coal for day trips but is a first choice for longer distance tours." 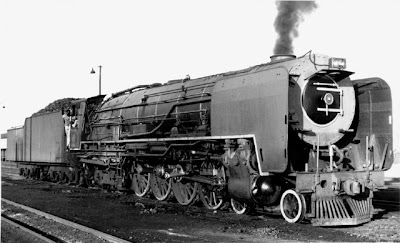 A very nice article about this locomotive 3472 may be found here. Class 25NC N0 3472 in steam - Reefsteamers in Germiston. Photo posted by "gbl" on outdoorphoto. Class 25NC N0 3472 in steam - Reefsteamers in Germiston. Photo: Hannes Paling. Photo: Michael F. Allen 25NC no 3472 - Remarks- Class 25NC 3472 hustles a freight train past the butte at Sekonyela in blazing glint lighting.